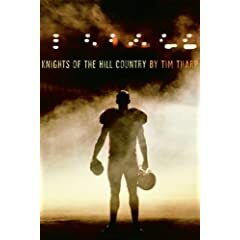 # of pages: 233 p.
This football story takes place in Kennisaw, Oklahoma where football is the most important thing on earth. Hampton Green, the star of the team, is trying to lead the team to the fifth straight undefeated season. This has only been done once before and those men are still revered in the area. Hampton’s best friend, Blaine, wants the undefeated season worse than anyone. Blaine used to be a very powerful player as well, but sustained a knee injury during the previous season. He tries to pretend he is still the same player, but anyone can see that he is not performing where he used to. As the team inches closer to the end of the season Hampton starts to notice for the first time that not everyone always agrees with what Blaine says. Ever since Hampton moved to Kennisaw in junior high and Blaine accepted him as his friend, he has listened to everything Blaine said and accepted it as fact. Since Hampton’s father left him and his mom and she fell apart, Hampton looked to Blaine and his dad for male advice. Now it seems that Blaine is getting defensive with his words and aggressive with his fists and it’s always Hampton who has to bail him out of tough situations. Hampton also meets a girl, Sara, who is not interested in football, but in what Hampton has to say. He really enjoys talking to her until Blaine insists she isn’t good enough and forces him to stay away from her. Hampton must come to decide if he should stand by Blaine because they have been best friends for so long, or if he should start thinking for himself and decide what he wants to do with his life besides football. Sports fans will enjoy this book and athletes will be able to relate to the difficult issues that come with having young athletes put so much stress on themselves. this book was so cool i love it! great book. i was really into it i just couldn’t put it done.